Los Angeles, CA. 29 December 2016 – Last night, Billboard charting artist Slim Jxmmi of Rae Sremmurd, celebrated his birthday with a Marvel-inspired party. Guests entered the swanky downtown LA venue, Think Tank Gallery, to be greeted by a large 3-D ‘Gotham City’ style projection wall and Wonder Women aerial dancers. This super hero party held numerous classic arcade games such as Whack-a-Mole and Pacman, an interactive PlayStation gaming station and a smokers lounge provided by West Coast Cure and Weed Maps. The attendees also enjoyed complimentary tacos by Casablanca and drinks provided by Jose Cuervo 1800. 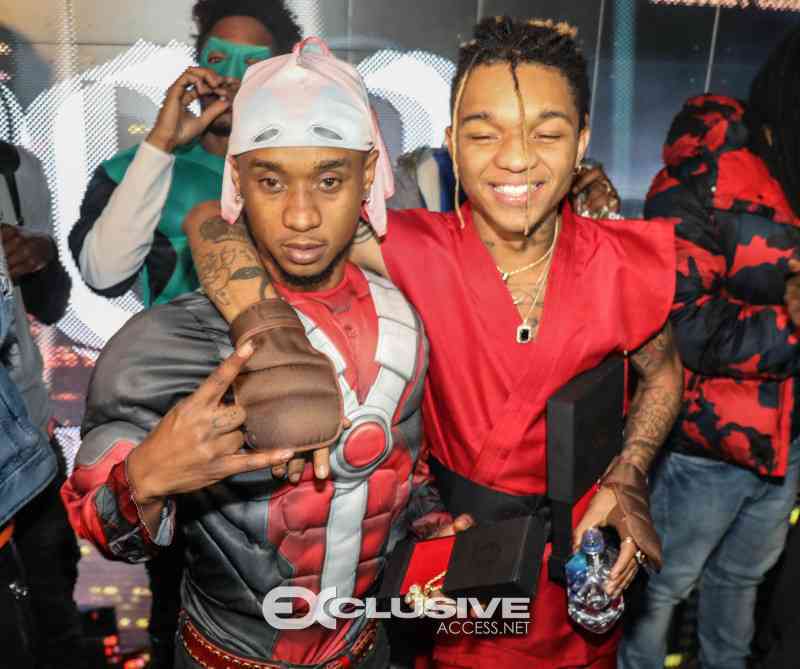 Jxmmi, Swae Lee and their crew arrived at Think Tank Gallery in a group of some of the best Marvel costumes including Iron Man, the Penguin, Batman and more. DJ Quintana, Sean G and DrewByrd turned the crowd up as they sung happy birthday to Jxmmi and his brother, Floyd, while they were presented two Superman and Batman themed birthday cakes by a Pinch of Spirit. “This party was the best… I got to turn up, drink, smoke and have a gaming tournament with all of my homies! Tonight was the first real birthday party I’ve ever had and I’m so appreciative for everyone who celebrated it with me,” Jxmmi states. Thank you to our event Partners: Lyft, Weed Maps, 3-D Live, King of Ice, Jose Cuervo 1800, West Coast Cure, Snapshots Photo Booth, a Pinch of Spirit, Bai Water and Moet.